APN Outdoor has run an advertisement for the Australian Vaccination-risks Network in Brisbane. 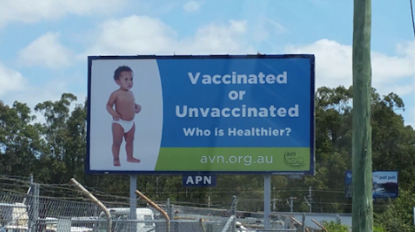 The billboard ad features a young child standing next to the words “vaccinated or unvaccinated, who is healthier?” with the Australian Vaccination-risks Network website directly below. APN Outdoor’s anti-vaccination billboard comes four months after the outdoor company decided not to run Aboriginal Victoria’s Deadly Questions campaign, which encourages people to ask probing, complex and controversial questions of Australia’s Indigenous population . Mumbrella understands the company decided not to run the Aboriginal Victoria ads after the Outdoor Media Association (OMA) advised that the ads could be “deemed discriminatory”. A spokesperson from APN Outdoor said in a statement to Mumbrella: “The ad in question is running on one billboard. The Outdoor Media Association advised us there were no issues with the ad. “APN Outdoor did not refuse to run the Deadly Questions campaign. As we explained in June, when the ads in question were submitted to us, we referred them to the Outdoor Media Association which in turn referred them to the Advertising Standards Bureau, which is usual practice. The new APN Outdoor anti-vaccination ad has already received some backlash on Twitter, with users labelling the ad as “disgraceful” and “irresponsible”. This billboard is feckin irresponsible. Disgraceful! Time to make @APNOutdoorAU aware of the consequences of their decision. What doesn’t kill you makes you stronger, apart from polio. What do you mean by “apart from Polio”? You will take anyone’s money. Don’t give them a voice that can damage everyone else’s child. You take care of your child, let others do the same. There should be studies undertaken to determine the truth behind this highly legitimate question: Who is healther – those fully vaccinated or those not vaccinated at all and even those vaccinated in moderation, with plenty of time between shots. That’s called science. Your comment, by contrast, reveals a ruthless fascist attitude, totally unscientific. There is no proven correlation between the vaccination status of a child and their overall healthiness, as the ad misleadingly implies. A vaccinated child should however be safer from infection by life-threatening diseases. The ‘client’ probably wrote the copy themselves to save the expense of hiring the creatives reading these pages. One looks forward to the fluoridation series. So it’s not a very good ad, if they are trying to argue the opposite. I hope the Federal & State Governments respond by pulling the plug on any planned APN media. Torching their quarterly forecast is a sure way to reverse this decision. Outrageous, irresponsible and immoral. Where is APN’s code of ethics? To deflect back to OMA is cowardly. APN made the call to run it; to amplify the voice and elevate the presence of this anti-vax network via the ad. The responsibility sits squarely on the shoulders of those that took the anti-vax money. Not sure the creative works that well?? There seems to be a obvious answer to the question being posed. My child is vaccinated and has autoimmune issues. And? How will I ever know if my kid would have been ok if not for all the chemicals injected into him since birth? Hiding behind the OMA is pathetic. APN have taken the decision not to promote a campaign aimed at driving debate about important Aboriginal issues. And they’ve then taken the decision to run an ad promoting anti-vaccination messaging. Their Board and Exec team should be ashamed. Rather than vilify people who choose not to jab their kids with chemicals which have not been tested for carcinogenic or genetic mutation Potential. You will find their kids have less to zero Chronic illness, barely get sick abd have no allergies. Lisa, even if what you have said is true (which it categorically isn’t) – I’d much rather my child have an allergy or two and get sick occasionally instead of contracting a preventable illness that could literally kill them. Shame on you and shame on APN for promoting beliefs that are both harmful and false. I agree with Lisa. Dead kids don’t have allergies. This issue is not about beliefs. It is about science. The question asked in the billboard is legit. Let public health officials launch a study with the co-operation of GPs to determine which kids are in fact healthier. Not gonna happen. ….except for all these kids that died because their parents didn’t get them vaccinated…..
Is that what your Doctor said? No they didn’t. Two words for you Lisa – small pox. And here’s another one- polio. Lisa, I do a great line in the latest horse and buggies. Every purchase you get a free horse-whip as well. Either that or catch up with the 21st Century. l think that there is something to be looked into here, and the question is a much needed to be answered question, especially when the Government will not do a study comparing Vaccinated to Unvaccinated. Why Not? Makes it seem like they are hiding something. Parents want and need to know. There is nothing to be looked into. Numerous studies have been conducted on that very issue and guess what? Those vaccinated had better health outcomes. Anyone who takes seriously a website called “thoughtscapism” and tries to tell us it’s scientifically valid needs their head examined. This is another one of those websites created in someone’s back bedroom to share that individual’s personal delusions. Good thing we have the AVN, which is totally NOT made in someone’s back bedroom, but is headquartered in the science and medicine hub of Bangalow NSW (pop. 2021). No personal delusions here! If you do a quick google search you will find links to various .gov websites showing the extensive research that has already been done which proves the effectiveness of vaccination. Just because they don’t spend money on advertising to counter every crackpot claim that’s out there doesn’t mean the government is hiding something. Perhaps dovetail it with an enquiry into anthropogenic climate change. I would suggest more but enough people have been burnt at the stake for claiming the earth is round. Seems like a fair enough question. Let’s bring this conversation out in to the open. To give a newborn baby a Hepatitus B Vaccine (sexually or blood transferred, usually by needles) seems completely over the top and an unnecessary risk to the baby when you look at the ingredients in this vaccine. Wouldn’t it be better to test the mother to access risk to the newborn? Great question and one I asked my doctor, the response “just in case you have Heb B even though test as negative.” ??? There have been studies that show that moms with Hep B whose babies were vaccinated still passed Hep B to them. It’s frustrating that because this is such a hot topic it is alll about all or nothing instead of having healthy conversations about each vaccine. —> Helena, luckily for you, this question has been looked into many times. The overwhelming scientific evidence is in support of vaccination. You can rest easy now, get your kids vaccinated, and spend the free time perfecting your tin-foil hat, so aliens can’t read your mind. Let’s be clear, not vaccinating your child is tantamount to child abuse. Government should legislate against this and thankfully they have to some degree. You can hold an opinion and disbelieve in vaccinations all you want, but you don’t get to override the scientific consensus just because you read Jenny McCarthy blog that one time and now you are qualified to debate the medical community. Vaccinated. Have a now 19 year old, who is fully vaccinated. This kid of mine is lucky to get the common cold. Never had all of the child illness (mumps, measles etc) I put that down to the vaccinations as she went to childcare fulltime from the age of 1… Vaccinations are a must.. my personal opinion…. Vaccines are for those who believe they belong to a ‘herd’. Just remember vaccines were created to mimic mother nature. We do our children a great disservice by over- riding their innate immune system with the fake and temporary immunity of vaccines. Yes we do our children a great disservice by ensuring that they don’t die of smallpox. I hope your children remember to thank you and celebrate your wisdom regarding ‘fake immunity’ when they’re crippled by polio. There is nothing criminal about this billboard…the scare campaign of the government and media continues…anyone with half a brain cell would ask this question, and many others about medications that are going into your children…wake up sleepy heads. Great work. We need more billboards like this one. At the very least we need to allow for choice in medical intervention (a basic human right), for dissent and free speech. If government and the medical establishment are so sure of their coerced vaccination agenda for the good of the public then why don’t they conduct a wide survey across Australia to determine whether vaccinated or non-vaccinated children/adults are healthier? Awesome idea. Why don’t you pay for it? I’d rather the Gov didn’t waste money verifying science that has been solid for several decades. Why don’t the government do study to check if the world really is round since plenty of people seem to think its not. Yes, some vaccinations have been known to cause issues in % of the people it was given to but that is unfortunate and nothing more. Given the complexities faced in modern medicine, finding something that works 100% of the time with no side affects regardless of genetic/environmental and other factors is damn near impossible and it’s a bloody miracle we have any vaccinations of any sort at all. Every other civilization before ours tended to be too busy burying their dead children to even have this conversation. The fact that we are here talking about this kind of proves that point.